Natural Fit Life-Healthy Can Be Done! Being born and raised in Africa I remember learning in my elementary history classes about the Bantu! I remember how I was fascinated to learn about many of the kingdoms in Africa and how the Bantu ruled many African Kingdoms. Growing up on what some will refer to as “The Motherland” I was taught at an early age about African History and I was extremely fascinated with my heritage. I might not remember everything that was taught to me at my young age but I have kept my respect for the culture and pride in knowing where I come from. Today, with many people referring to Bantu Knots as a hairstyle for people enjoying Natural hair I wanted to share some about the origins of the Bantu and some facts that are probably unknown to most people. A little while ago I did an interview about my friend's hair journey, her chosen name is Africa. 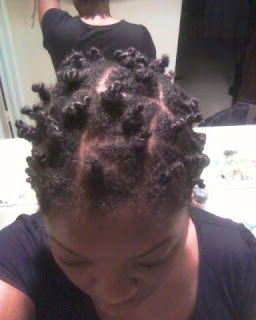 Below is a picture of one of her good friends in Bantu knots! Bantu knots are also called Zulu knots you will see why as you keep reading. Bantu originated from West Africa. It’s through many waves of migration that they spread through other parts of the continent! Among the groups that were taken as slaves from Africa, Bantu comprised most of the African slaves. So sad to say, but many of you black sisters and brothers reading this might be of Bantu origins. Bantu means “People” in many Bantu languages. I say Bantu languages because in Africa it’s common for many groups to speak a language with some variations. The same way someone in the Northern parts of the US might say or pronounce a few words differently from someone in the South. A common characteristic of Bantu languages is that they use a stem form such as -ntu or -tu for 'person', and the plural prefix for people in many languages is ba-, together giving ba-ntu "people." The word Bantu was first used by Wilhelm Bleek (1827-1875). Bleek was a linguist born in Germany. His dad was a professor of Theology at Berlin University and Bonn University. Bleek graduated from the University of Bonn in 1851 with a doctorate in linguistic. He studied Hebrew before falling in love with African languages. He moved and lived in South Africa and spent most of his life there researching and investigating the languages. It’s in Cape Town that he met his wife Jemina Llyod. His wife did with him much of his researches and continued alone after his death. He actually died in South Africa and was buried in Cape Town. See!!! Now you know about the man who was the first to use the word BANTU! Bantu groups had a specific division of tasks between men and women. The men worked as herdsmen, artisans and hunters. Women were in charge of the farming and housework and oftentimes worked as a team by organizing their tasks as a commune. This is actually very common in many ethnic groups throughout the continent! Bantu comprises over 400 ethnic groups in Africa.From Cameroon (central Africa), Southern Africa, Central Africa and Eastern Africa. There are many variation to the Bantu language but they still maintained a few common customs and languages. In South Africa the term Bantu was used as a very derogatory word toward the Black South Africans especially during apartheid. There are a whole lot of things to be said about Bantu in the context of Southern Africa. In Southern Africa the Bantu language was divided into two main groups the Nguni which included the Zulu and Xhosa language for example and the Sotho-Tswana. The Nguni were known to occupy the eastern coastal plain whereas the Sotho generally occupied the plateau (wow, so many childhood memories of my geography and history classes are rushing up in my brain as I am typing this). What's interesting on the subject of Nguni and Sotho is that Nguni changes in their pronunciation of Bantu words included the addition of click sounds! In other parts of Africa Bantu it's not seen as a derogatory term. Another thing that's cool to know is that based on the regions where they lived people developped important skills. It's the Bantu who reached the central rainforest regions while migrating away from the drying sahara who developped new agricultural techniques and plants notably in Zambia, they used advanced technologies during the iron age. They also brought the concept of cattle raising to regions that were unfamiliar with raising cattles. One of the most fascninating fact to me growing up was the history of the Great Zimbabwe city. It was the capital of a major empire. The city was known for its trade routes benefiting arabic traders of the Swahili coast. Even China was reported to trade there as well. The trade included goods such as gold, copper, ivory,animal hides, precious stones, metal etc.. Can you see how rich the continent has always been? Nowadays Bantu is more referred to as a language group. There is now little need to refer to it as a specific ethnic group. Did you know that the Swahili is a Bantu language? It’s not just spoken in Kenya as many people tend to assume. It’s actually considered the main language among 50 + millions people living in countries along Africa’s East Coast! This picture I found online is apparently from a Somali who specified that in her language bantu knots are called duuduubs. The Bantu in Somalia are originally from ethnic groups in what is today Tanzania, Malawi and Mozambique. They were brought to Somalia in the 19th century as slaves. In Somalia Bantu are an ethnic minority. They speak Somali as very few have kept the Bantu language. They may have darker skin than the lighter skinned Somali and rounder facial features. The Bantu were brought to Somalia not because of migration but because of slavery in the 19th. When I think of Somali Bantu I am saddened by many of the unjust treatments they have endured especially during Somali Civil War. I am certain many of you had heard a few years ago of the Somali taking refuge in American cities because they were evicted from their lands and suffered from wars, persecution and famine. Well, I said this was an introduction if I keep going we will all feel like we are seated in a lecture on a College campus. There is nothing wrong with that!It's just that I want you to retain most of what you've read so I will stop at that. I might come up with a part 2 because there is just so much that can be said about the Bantu origin and the history of the African continent! I hope you enjoyed learning more about the origins of the term Bantu! For my Black readers I hope this article will trigger a sense of pride for your heritage. For my other readers I hope you will appreciate something totally new. It's great to be better educated. Don't you think? If it's your first visit on the site please become a Follower and Like the facebook page Goodhealthdiva. I would love to know what you think so please leave some comments and give us all the pleasure of reading your feedbacks or your perspectives! What do you think about all that you just read?Have any of you done Bantu knots before?Want me to show off your bantu knots? Fabulous and so informative. This is a great history lesson! @Dani, you are right knowing the origin of something can make us more appreciative of its value! @Africa,Keyanna and Robin I am very honored that you appreciated this post. Writing this post and sharing some of my continent's history meant a lot to me! Very interesting, and I have done Bantu knots on my daughter...so neat to know where the word came from and the meaning behind it! This was super! I truly enjoyed this post. So much information. I keep wondering if this is not what we call 'corkscrews'? @ Naturaleza I am so glad you enjoyed this post. I don't know but to think of it the style does look like 'corkscrews' so it would be a fitting name and with the given history of slavery time I can see how corkscrews could have been an adapted named in some regions. I love researching the origin of things and I must admit that this post is one I am actually the proudest of because I was born on the African continent and it felt very special to share all this information! I LOVED reading this sis. I just adore reading anything that has to do with Africa, but especially this because it has to do with History AND Natural Hair which are 2 of my most favorite things!! Thanks for posting it and for sharing it on ONK! I feel that every style we use on black hair must have a story. I know they have the Ghana Braids, Senegalese Twists, etc. I would love to know more about their orgins! Thanks for this I can't wait to do my first Bantu Knot-out! Very interesting and educational article. I just have one point of correction. Cameroon is not in West Africa, but is rather part of Central Africa. I do know that some Cameroonians consider themselves West African, but officially they are part of Central Africa. Just wanted to clear that up. Stumbled upon this post in researching the origin of bantu knots, and this was a great post! Very informative! Thank you! Wow good information. This makes me want to study African history. We call them "corkscrews" in Grenada (Caribbean). Healthy Can Be Done! If you like to browse at some of my Natural Hair pins! Thanks!! This is really interesting and very helpful as I'm writing a report on the Bantu people. I really enjoyed this. For my daughter's dance class I sometimes put her hair in "zulu knots" (which is what I've always called them). We home school and today she asked about the hair style and who wears zulu knots. I knew they were of African origin, but not much more, so off to the internet we went!! Thanks for posting the History of Bantu!! Very interesting and educational. I wish we all could have the opportunity to learn more about our African heritage and how it influences our current cultural habits and daily lives. I plan on sharing this with my daughter and granddaughters. Thank you so much !!! This a great article. I am have been wearing my Bantu knots for three months and love them..
love this - thank you for the history of my zulu knots! Nice post. I learn something more challenging on different blogs everyday. It will always be stimulating to read content from other writers and practice a little something from their store. I’d prefer to use some with the content on my blog whether you don’t mind. I’ll give you a link on your web blog. I recently came to know about www.avanaaustralia.com, their Natural Skincare products are very effective. Natural Skincare Thanks for sharing. Good article overall but as a fellow African and descendant of the Bantu tribes...my history lessons never taught me that Bantu people originated from West Africa. Wondering where that little piece of information came from? We migrated from Central Africa. This was great I've recently been in quest to become better educated on my history, especially being a black American I have a severed relation with my culture,sad but all I can do is try to understand more of the place my forefathers originated and maybe gain some peace in being somewhat be apart of something great. Thank u! I'd love to read more or if you could suggest any other readings that would be appreciated! NYC but I live in NC now and I'm tickled sometimes when I walk around my town with my Bantu knots and people are either amazed or don't know where to look when I do. It amazes me the power of black hair. Loved the article, i e learned so much. Thanks for sharing. Hi only again we happy to meet you, We AOS Products: www.aosproduct.com really want to say thanks for your wonderful post!!!! Grateful for the history of Bantu knots and grateful for your willingness to share it with the rest of us! I would like to keep this knowledge close to my heart,I'm surprised how long ago it was posted, I was so captivated by the history and the comments, I decided to say something! Thank you all for you comments. My 4c hair natural hair stays in Bantu knots most of the time. 2 strand twist at other times. These are the styles under my wigs. Summertime comes and it's see ya later wigs..lol, the winters can be very brutal here in Chicago area. We just installed a water softener for our home and I am excited to see how my hair responds to it. Our skin was so dry this winter and I couldn't take it anymore. My hair is like a plant! I wet it in the morning and before going to bed, I tie a silk scarf b4 getting in bed, my hair loves it..I wish I had known my hair needed moisture years ago. I didn't get the hint when Jeri curls worked, because my hair really grew long...the downfall and jokes, were the spot on the walls from product, your pillow case,your shirt collar,other ppl face if you hugged them..etc..so we stop wearing it. I am elated that we as a ppl can proudly display our crowns and love and support each other in a world that has been trained to look at you with disdain if your hair isn't proper..lol (Older Generation ) 80's my dad say you're going out like That?? Comb your hair!!! I thought I was cute...I was😂 . I love what I've read and am inspired to read more..Thank you! Welcome to my corner of the blogsphere where your life can be enriched with valuable tips and ideas to direct you into a sweeter and more vibrant lifestyle. I hope this blog will be a place of inspiration where you would enjoy coming to for enrichment. Count your blessings: Album of my favorite things. Simple and very effective remedy for Food poisoning! Fitness Motivation for weight Loss " Show UP"
JOIN US NOW AT WWW.GOODHEALTHQUEEN.BLOGSPOT.COM SEE YOU THERE!